The Biblical World: Another reason why people should read the Bible before they quote from it. We are entering the stupid season, sometimes described as the election season. Is that like "when God closes a door, he opens a window" or the misinterpretation that "God never gives us more than we can handle." Sigh. 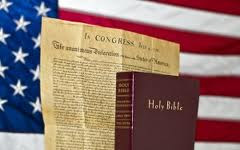 The fact that politicians attempt to reference the Bible could be taken as an admission that they know that most of the people in this country lean toward Christianity, if they claim a faith at all. Unless the individual politician actually practices Christianity, he or she must hire a consultant in order to get up to speed on the topic. (That is if the politician is humble enough to admit a short coming on the topic.) All I can say is, either these politicians are not smart, or they are squandering their money on bad consultants. Either way, I agree, this is the season that really brings out the stupid in American politics. The Fact of the matter is. 99% of the ministers don't know the bible.None will almost none, of the Christians will ever talk about this passage in the bible.